London is one of the largest cities in the planet. Our nation’s capital contains numerous areas that vary in size, population and character. Generally divided into 32 distinct parts that go by the name of “boroughs” London can very well be one of the best places to live in. Among the aforementioned boroughs, the one of Tower Hamlets ranks near the top in terms of economy, conditions, crime rates and many other factors. The London Borough of Tower Hamlets lies to the east of the City. The place has a long, complex and very interesting history. For centuries it was closely related to the maritime history and culture of London. 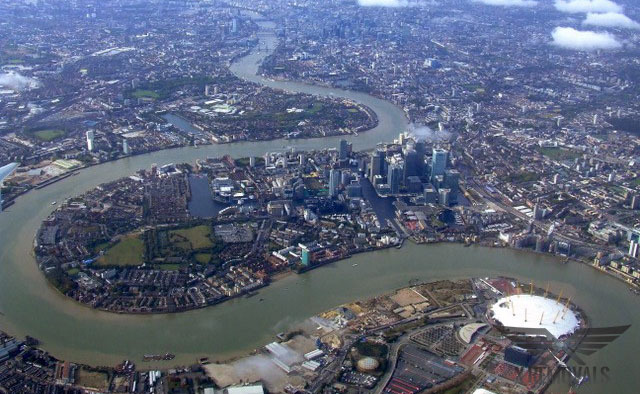 The present day district of Canary Wharf for example was where the East India Docks were located. Once home to sailors and merchants, as well as huge storage spaces, ship-repair factories and customs, today Tower Hamlets is a mix of urban financial districts and comfortable residential neighbourhoods that benefit greatly from the close proximity to the most central parts of London. Canary Wharf itself was recently transformed into a thriving financial district. Skyscrapers dominate the landscape here and countless international companies have chosen to set up their UK, and even European headquarters namely here. But in addition to a place for business, Tower Hamlets is also a great area to live in. Here we are going to take a look at four distinct areas that will present you will all amenities and opportunities a person can hope for. Of those residential districts, Isle of Dogs E14 is probably the most interesting one. The word isle is not exactly precise – actually the area is bounded by water on three sides – by one of the largest meanders of the River Thames. The official designation was approved however in 1987, after decades of colloquial use, if not centuries. It was a place for ship building as well as processing goods brought to London by merchant ships such as flour and sugar. After the closure of the docks in Tower Hamlets, the area much like many other districts around, fell into demise. The fortunes changed in the past several decades however. It particularly benefits from the development of the neighbouring Canary Wharf where just in the past couple of decades alone well over 90 000 new jobs were created. Isle of Dog is now a fashionable and rather desirable residential area that you should definitely consider. And if you are still looking for a cheap, dependable and quite efficient way to relocate to East London, hiring a licensed man and van in Bow may be the solution to all your problems. Formerly known as Stratford this suburban town currently has population of 27 720 and lies 4.6 miles away from Charing Cross. During the 17th century the area was known for the production and processing of porcelain. Today industries of any kind are absent in Bow and the town has transformed into one of the best places to live in Greater London. The last area we would like to bring your attention to is Bethnal Green E2. It was named after the eponymous open green space. It is located nearer Central London than the previous areas we talked about and is served by its own tube station, which is always a plus. It has population of over 27 000, and in contrast to other residential districts in Tower Hamlets, it has a much more distinct urban character, so if you are looking for such a place, do consider Bethnal Green.